Glorantha has so much background material that it sometimes can feel intimidating to enter. In fact it is not. Glorantha is what you make of it. One of the true old timers among Glorantha gamers is Joerg Baumgartner. He answered a question in the Google+ Glorantha community so well that I asked him for a permission to repost it as a guest post here in Notes From Pavis. At the end of the post I will provide directions to three other earlier posts how to start with Glorantha. Having fun with games or good reads is the best way to start into Glorantha. You can become the obsessed scholar if or whenever you want. Been there, done that. Several alleys of exploration are available. 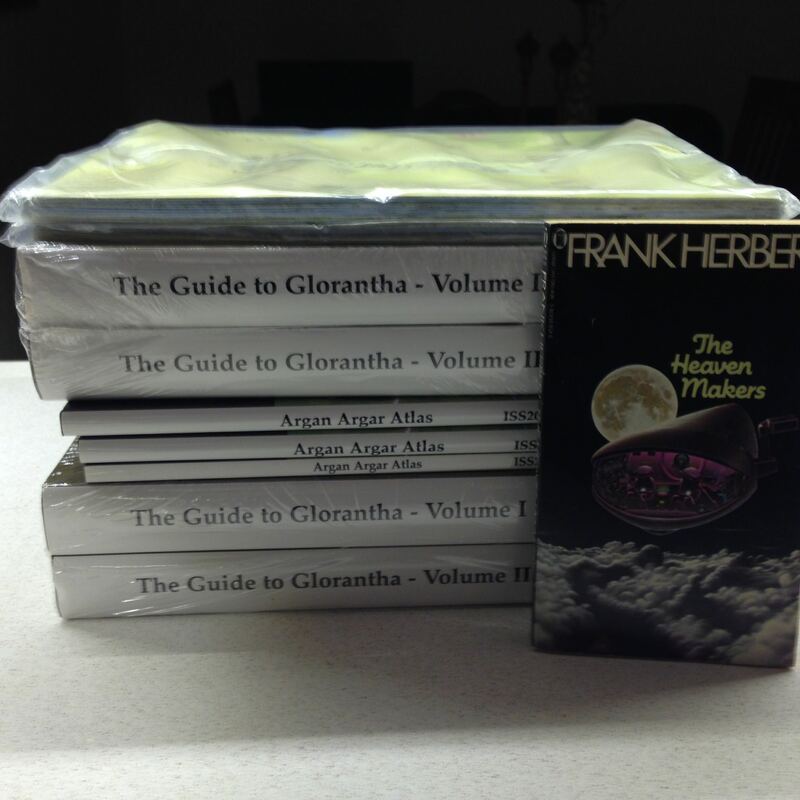 Now with the classical RQ2 supplements (soon) again available (as pdfs), any one of Pavis, Borderlands, Griffin Mountain or Cults of Prax offer an introduction with a very manageable learning curve (though it has to be said that Cults of Prax contains fundamental information on how the gods and their cults work in Glorantha). These place you a bit off center for the prequel of the Hero Wars. Both the Sartar Campaign and the Pavis book for HeroQuest offer good introductions while putting you in the midst of the big action as it unfolds. Start with reading HeroQuest Glorantha, though. 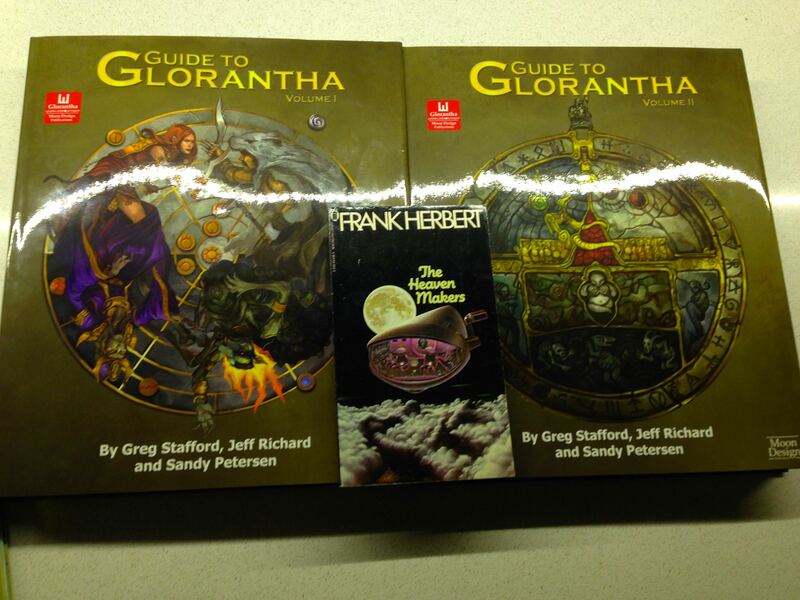 I have no doubt that the upcoming RuneQuest Glorantha will see some support for introduction into Glorantha. Similar for 13th Age Glorantha, whose accompanying Glorantha setting book (free of any game constructs) probably is going to be the best introduction for playing in the early parts of the Hero Wars. King of Dragon Pass lets you play an Orlanthi clan in what becomes the kindom of – not Sartar, but your king, if you play the long game victoriously. While not creating a canonical Sartar, you learn about all the difficulties and challenges Sartar had to overcome to found his kingdom, and you will gain a good insight how Orlanthi clans interact. And the game can be highly addictive. The Collected Griselda is set in Pavis and was started as a solo-playing fanfic, but it reads great and offers a very vivid insight in the machinations of the city, its occupators and the resistance. Highly recommended with either the RQ2 Pavis/Big Rubble books or the HeroQuest Pavis book. King of Sartar is a book for people who enjoy scholarly puzzles, shock full of texts written as in-world documents. One of the major influences which hooked me on Glorantha (after reading the RQ2 Pavis material and the then much smaller Genertela gazetteer that now has been subsumed in the massive Guide). 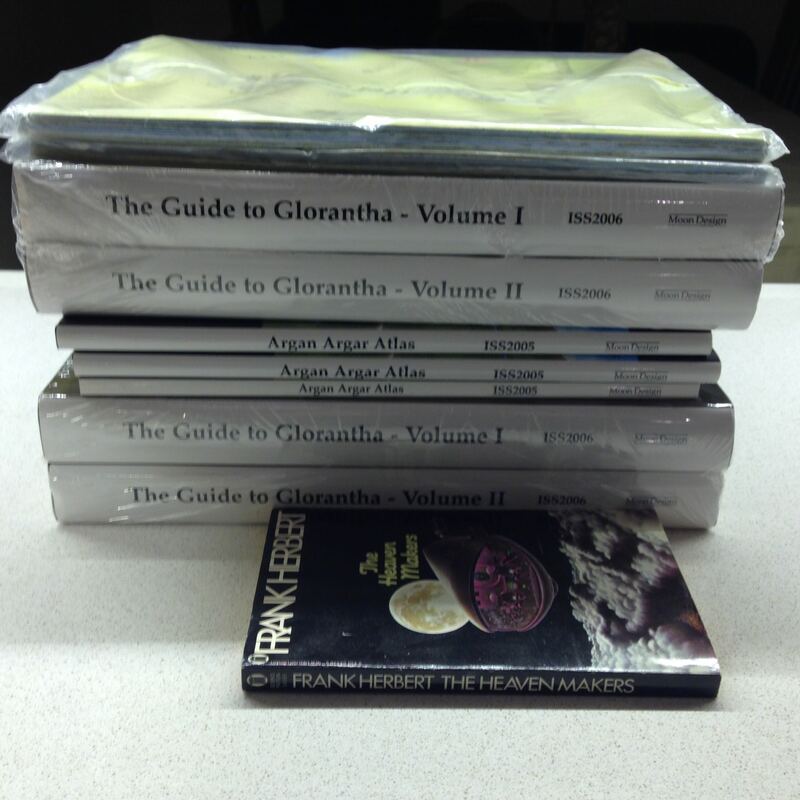 The Guide to Glorantha is exhaustive, but for first contact with Glorantha also exhausting. 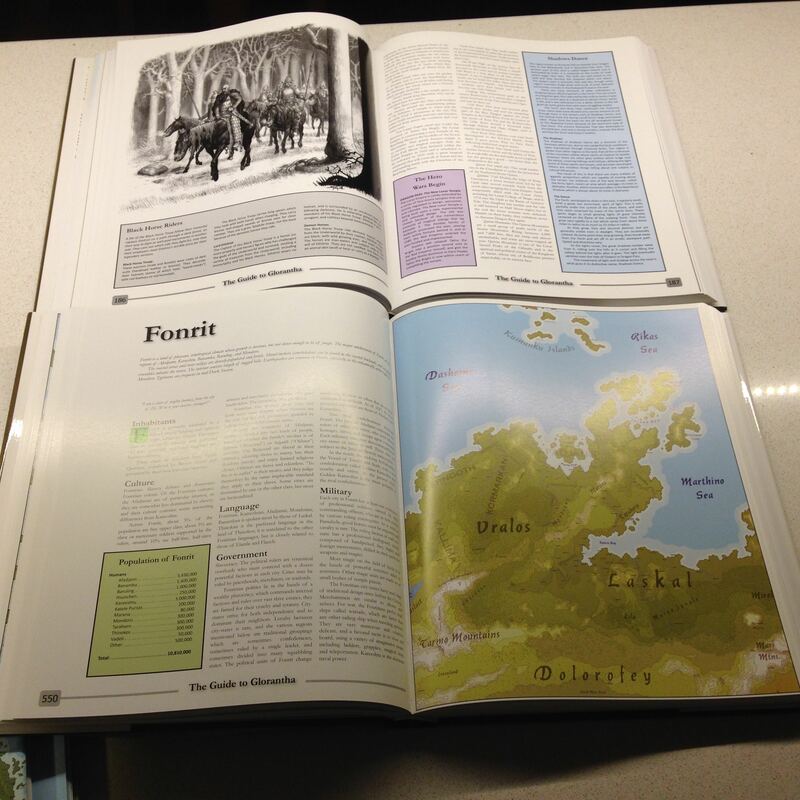 Having the pdf as a look-up reference is fine, but I wouldn’t suggest to start exploration of Glorantha by trying to absorb the whole of that massive tome. Penelope Love published a Gloranthan novel and a shorter collection of short stories via the Chaos Society (Deutsche RuneQuest-Gesellschaft e.V.) which capture a similar RQ2 flair as the Griselda stories. There is an abundance of conventions where you are guaranteed to find a Gloranthan game (although they might be full, in which case you might be reduced to sitting in watching other people having the fun). 2016 is going to see five conventions with Glorantha as one of their main attractions – Continuum in Leicester, England, Chimeriades in France, Eternal Con and The Kraken in Germany, and the initiative by Chris Lemens the week before Gencon in Texas. Gencon will see Glorantha games, too. Then there are the possibilities of play-by-hangout, play-by-forum or play-by-email games, all of which can be very rewarding. Often you’ll be able to “sit in” watching other people exploring a small part of Glorantha. Not guaranteed, but with a certain likelihood these specialized conventions may also offer Glorantha-themed freeform games, a very immersive way to experience the world. How it all began – the games White Bear and Red Moon (later editions: Dragon Pass) and Nomad Gods are about moving stacks of unit counters across a hex map. Definitely old style wargaming, with a high importance of the magic. Hard to get nowadays, but you ought to be able to find a game at one of those five conventions mentioned above. Chris Klug is working on putting the premise of WBRM/DP into a boardgame with a lot less administrative overhead. Sandy Petersen’s Gods War, a game similar to Cthulhu Wars but firmly based in Glorantha, and great fun to play, is going into kickstarter within the next two months. If you play this, you’ll get a good insight how the major pantheons of Glorantha interact, and how Glorantha was almost destroyed before History started. Also on the horizon: a boardgame by Rainer Knizia, with a Praxian theme. Not a continuation of Nomad Gods, but a eurogame. Exchanging GM info with other GMs in adjacent areas. I was involved in several such cooperations, such as the Wilmskirk Tribal Federation info exchange which had campaigns for all four tribes putting together their data, or the Whitewall Wiki. As a narrator I felt a lot more secure about presenting a living world by getting feedback from the other campaigns in the neighborhood, discussing scenario ideas and outcomes. So if you want to have a review board of other Gloranthan GMs, go networking. One of the most recent technologies are private G+ groups where GMs invite interested people to have a look at their campaign and current scenarios. Even if you should get no new input to improve your campaign (an unlikely case), presenting your plans before actually playing them out will make you focus, formulate and fine-tune your ideas. You don’t have to be a GM with 20 years of Glorantha experience. Some of the people who comment or listen in are bound to be, make use of their experience. This concludes a very nice view from an old hand to those about to enter the wonder that is Glorantha.